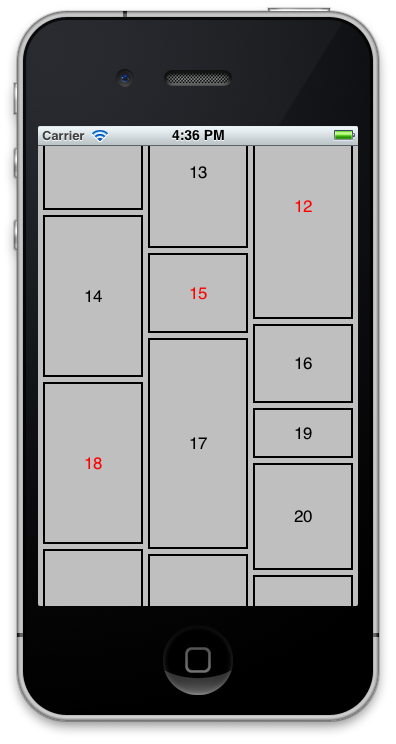 EKStreamView renders a number of columns containing multiple cells by reusing the cell views whenever possible, similar to UITableView. It's fast even you have hundreds of cells since only a small number of cells are actually created. Copy EKStreamView.h and EKStreamView.m to your project. This class is ARC-enabled. You must build it with ARC. Implement the required methods in EKStreamViewDelegate protocol, and implement the optional ones optionally. This class acts very similar as UITableView. However, in a UITableView, your cell should subclass UITableViewCell, while in EKStreamView, your cell is only required to conform to the protocol EKResusableCell to provide a reuse ID.